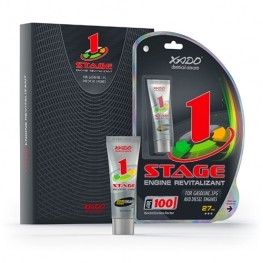 XADO 1 Stage Revitalizant is an advanced third generation engine treatment product designed to protect and restore mechanical engine parts. Years of science and tribological research along with the XADO Revitalization application method has enabled the design of an advanced product that contains the optimum concentration of active nanoparticles. This new advanced 1 Stage technology is a fast acting catalyst that creates a self-regulating ceramic-metal coating on any worn metallic surfaces. This patented product extends the life span of all Petrol, Diesel and LPG engines in a universal, easy to use, single application. The product is designed to restore, protect all mechanical moving parts from wear and tear as well as increase the power efficiency of the of the engine, manual and automatic gearboxes as well as differentials. Once the revitalization process is complete the vehicle component’s life span with have increased 2-4 fold. The main characteristic of the metal-ceramic coating is its self regulating properties. Once applied the vehicle’s mechanical moving parts therefore always will be maintained in perfect condition. You may also be interested in: Classic Revitalizants.